The wait was over for individuals and companies alike this weekend, as the Fork Lift Truck Association announced the winners at its 19th annual Awards for Excellence. Co-presented by Channel Five news presenter, Emma Crosby, the Awards saw key industry figures, from far and wide, descend upon the Hilton Birmingham Metropole to see who had won an Archie – the materials handling industry's most coveted prize. 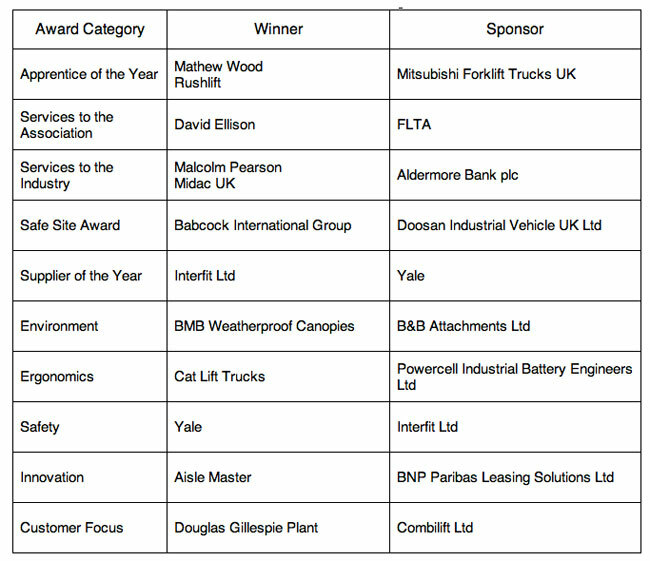 Big product category winners on the night included BMB Weatherproof Canopies' Pallet Truck Bag (Environment), Yale's Mast-Mounted LED Lights (Safety), Cat Lift Trucks' NPP16-20N2 (R)(E) Power Pallet Trucks (Ergonomics), and Aisle-Master's Cold Store Aisle-Master; each receiving a solid bronze statuette following a public vote through the FLTA website. Individual Awards were presented to Mathew Wood of Rushlift Ltd (Apprentice of the Year), Malcolm Pearson of Midac UK (Services to the industry), and the Association's former chief executive, David Ellison, was honoured for 'Services to the Fork Lift Truck Association'. Babcock International Group was named "Safe Site" for their innovative approach to safety management. Rather than dictate protocol, Babcock involved all of its fork lift drivers and supervisors in an open and honest discussion on the subject of safety to identify key issues. Discussions resulted in the introduction of 21 safety standards, and empowered more than 550 staff to help achieve compliance. Since 1995, the Awards has served as a "Pick of the Year" for materials handling products and services, rewarding those who strive to raise standards throughout the fork lift truck industry. Emma Crosby was aided in this year's presentations by Association chairman, Martyn Fletcher. The pair opened the show in humorous fashion, with the two hosts anchoring their very own news show broadcast. Through the course of the evening, they were joined by representatives from each of the event's Sponsors, including: Mitsubishi Forklift Trucks UK, HSS, Aldermore Bank plc, Doosan Industrial Vehicle UK, Yale Europe Materials Handling, B&B Attachments, Powercell, Interfit, BNP Paribas Leasing Solutions, and Combilift Ltd.
During dinner, the winner of the inaugural Customer Focus Award – identifying the fork truck dealership deemed to have provided the most innovative or appropriate solution to a customer's particular materials handling requirements – was decided by an open vote of attendees. A great cheer went up as Douglas Gillespie Plant was announced winner. Afterwards, guests enjoyed a tribute to the Sixties with cabaret performer Miss Sixties and danced into the small hours with Awards' favourites live. 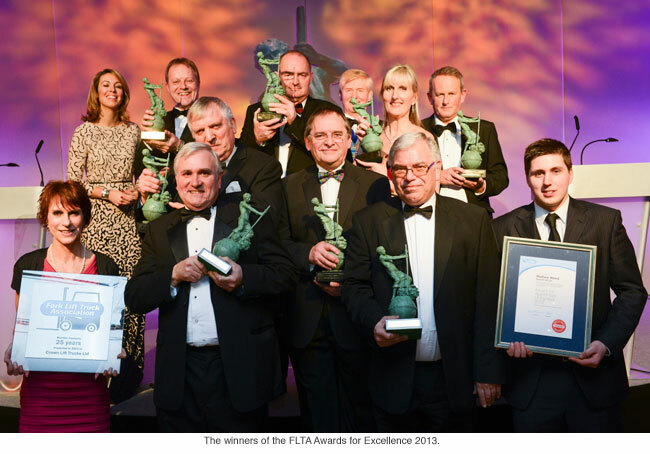 "Awards 2013 has been a resounding success," said FLTA chief executive, Peter Harvey. "This event continues to celebrate all that is good in the materials handling industry and, for more than 19 years, we have encouraged the progress that has been achieved. Every one of our 'Pick of the Year' represents a significant advance in ensuring that fork lift trucks are working more safely, more efficiently and with less impact on the environment. We are proud to recognise and reward such advances."